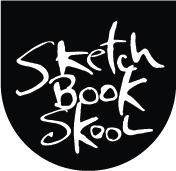 I am working on my homework for Week Four of Polishing at Sketchbook Skool. Nelleke Verhoeff is a fantastic teacher, a former street performer, hilarious and imaginative, and if you have missed her klass, please try to take it next time Polishing comes around. Love your videos! Thank you for sharing them! Thank you Danny, enjoyed seeing your sketches and your work in your Moleskine. Impressive and inspirational. Thanks Danny I love that short teaching video! Will start a book today! That was so much fun! Watched the video and I am jazzed to try this with my students. They love playing around in The Art of Play and more! Hilarious seeing you powder up! The video pulled me out of a frustrating state of trying to work solely from imagination. The photo mug shot idea spurred me to create 3 faces on my toned paper. Pretty happy with the result thanks to your awesome demo.n love the klass! Well that was great and, as usual, totally inspiring (and amusing). Thanks.